SUGGESTED USE: Take with food for optimal results. If your weight is less than 120 lbs, take 4 capsules, once a day. If your weight is greater than 120 lbs, take 8 capsules, once a day. If your weight is less than 120 lbs, take 4 capsules, twice a day. If your weight is greater than 120 lbs, take 8 capsules, twice a day. 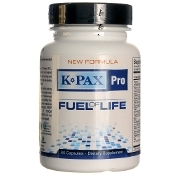 Kpax Immune Support Formula rovides an abundant supply of micronutrient antioxidants (includnig Acetyl-L-Carnitine, Alpha Lipoic Acid and N-Acetyl-Cysteine) for immune system health and support.